Top speed of 118 mph engine typedrivetrain: Overhead-valve, v8 displacement 3,168 cc (3.2 l) power rating 140 hp transmission 4-speed manual chassis: Torsion-bar suspension; Pinion-and-sector steering; Hydraulic drum brakes; 3,219-3,310 lbs. price: $11,900 for the convertible in the United States in 1959-60. Protruding nose designed by count albrecht goertz, the 503 was built on the same 112-in. Wheelbase as the four-door 502 and had the same box-and-tubular-section chassis. The long hood and rear deck were also the same, but the body of the 503 was made of light-alloy aluminum. On the cars protaiding nose was the bmw twin-kidney grille. Flanking two side grilles were round parking lights and, above them, shrouded headlights. A trim strip ran the length of the car. highpowered v8 the 503s 3-2-litre v8 came with twin carburetors and a higher compression ratio than the 502s engine. The transmission, originally installed under the front seat, was moved behind the engine in 1957, allowing a floor shift to replace the steering-column gearchange. 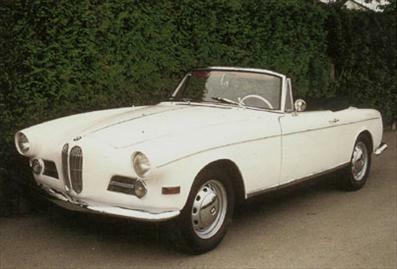 This elegant bmw 503 convertible was introduced at the 1955 frankfurt show as one of gemtanys first post-world war ii sports models.